A fashionable concept, resilience is now a must in both academic research and management. However, its polysemy nourishes many debates on its uses, heuristics and operational relevance. The purpose of this article is not to bring these debates to a close. Starting from a cross-disciplinary state of the art, we point out the incompatibilities between certain meanings and uses of the term. These inconsistencies raise theoretical issues, leading some researchers to reject the term for that matter, especially those outside the cindynics field. The analysis of the concept also brings out some methodological pitfalls. These are evident when attempting to translate theory into operational terms. Resilience is indeed seen as a promising response to recurrent difficulties in risk management. Nevertheless, it solves them only partially and produces new ones. Lastly, its implementation involves ethical and political risks. The injunction to resilience that seems to prevail internationally is in fact implying a number of moral and ideological assumptions which are not always clearly stated and remain serious issues. Concept à la mode, la résilience s’impose désormais tant dans les recherches académiques que dans les pratiques gestionnaires. La polysémie du terme nourrit de nombreux débats sur son utilisation et sa pertinence heuristique et opérationnelle. L’objet de cet article n’est pas de trancher dans ces débats mais de montrer, à partir d’un état de l’art pluridisciplinaire, qu’il y a incompatibilités entre certaines acceptions du terme. Ces incompatibilités soulèvent des questions théoriques, qui conduisent d’ailleurs certains chercheurs, en particulier en dehors de la cindynique, à rejeter l’utilisation du terme. L’analyse du concept fait également émerger des écueils méthodologiques. Ces derniers sont manifestes lorsque l’on cherche à traduire la théorie en termes opérationnels. La résilience apparaît en effet comme une réponse prometteuse aux difficultés récurrentes rencontrées dans la gestion du risque. Or, elle ne les résout que partiellement et en suscite de nouvelles. Enfin, sa mise en œuvre comporte des risques éthiques et politiques. L’injonction à la résilience qui semble s’imposer jusqu’à l’échelon international, implique en effet un certain nombre de présupposés moraux et idéologiques, qui ne sont pas toujours clairement énoncés mais qui posent problème. From Vulnerability to Resilience: a Big Step Backwards? Pushing Resilience to its Limits: Who States Resilience, When and Why? “Some cities do better in the face of disaster than others. It is tempting to describe apparent success in terms of resilience and apparent failure in terms of a shopping list of explanatory variables. Resilience then becomes the synonym for survival and the prescribed antidote for administrative shortcomings. This is too simple (…) Far from a fix-it-and-forget-it approach, resilience is the outcome of a long-term process, enduring resilience is a balancing act between risk and resources, between vulnerabilities and escalating or unmanageable risk” (Comfort et al. 2010a: 272-273). 1Resilience is “fashionable” of late, as much with scientists as with the administrators and international authorities in charge of preventing disasters. Comfort et al. call it a “buzzword” (2010) and see its consecration with September 11 attacks and Katrina. Klein et al. rather emphasize its link with papers and concerns on climate change (2003). In any case, the omnipresence of resilience makes one wonder about its pertinence. In fact, the abundant use of the concept, especially in social sciences, does not always come with a solid theoretical base. The word then becomes a holdall word used with a variety of meanings, just like other fashionable concepts (sustainability, governance...) that are often used in relation to it (Aschan, 2000; Gallopin, 2006). 2The polysemy of the concept resilience is not a problem per se; it is even productive in terms of heuristic and methodological issues (Folke, 2006). The difficulties arise when, little by little, the polysemy seems to legitimize a semantic blur that creates theoretical and operational dead ends. In view of occasional contrary injunctions, the concept ends up being “inoperative”, being reduced to some sort of unattainable discursive utopia to the point where some researchers have considered the concept too vague to be used in order to prevent disaster (Manyena, 2006). 3We shall discuss two points here. First, polysemy implies a rigorous use of the words, and if we want to use resilience in an operative way, we must keep in mind the theoretical issues and the methodological limits that come with the different meanings, while paying attention to the intrinsic contradictions of certain uses. Hence the provocative title of this paper that aims less, in the end, to say what resilience is than to say what it is not or what it cannot be. In addition, because resilience is thought to have an operative ambition, we can’t omit to reflect on the conditions of its uses by non scientist decision makers. The spreading of resilience outside of the academic domain and the way it is used in the field by different protagonists bring up ethical and political issues that make the passage from theory to practice uneasy. 4Thus, this paper has a double purpose. We are not aiming to establish a final definition for the concept. Beyond the impossible consensus on the meaning of the word this would only impoverish it. We wish to expose the limits and contradictions of certain uses and to shift the debate towards analyzing the discursive, ethical and political issues around resilience. 5The concept resilience has been the object of numerous publications. Even if etymology is often used to support its definition and if this etymology receives a global consensus, it is not the case for the origin of the scientific concept (Tisseron, 2009; Klein et al., 2003; Godschalk, 2003). Hence, according to the sources, in the scientific field resilience was born through either engineering, ecology or psychology. Nevertheless, everyone agrees on the fact that the concept is multidisciplinary and that it has greatly spread outside of its original disciplinary fields (Turner et al., 2003; Cutter et al., 2008; Hernandez, 2009; De Bruijne et al., 2010, etc.). 6Resilience is more and more used in hazard research or cindynics. Disaster results from the exposition of an element at risk to a hazard or a source of danger. However, there is only a disaster if the element at risk is vulnerable. When a threat becomes reality, the impact causes material damage, perturbations or disruptions. Beyond a certain level of disarray, we are dealing with a crisis, a state in which the system’s functioning is perturbed in such a way that we find ourselves in an extraordinary – abnormal – situation (normality being a state of reference here, generally the initial state). Yet, a crisis doesn’t necessarily bring about disaster and even if it does, a disaster rarely is an irreversible state of destruction. Most of the time, there is recovery, reconstruction, renewal, a return to equilibrium, to normality, etc., all situations that can be linked to the concept of resilience that, etymologically, refers to the idea of rebound. 7If scientists generally agree on this first analysis, the use of resilience as an outcome, a state, a property or a process has being distinguishing different research communities (table 1). However, determining whether resilience is an outcome, a property or a process is a critical step toward its application. At this point, resilience’s exact definition and uses are far from being unanimous. According to some researchers, resilience is both a process and a state (or an outcome), described as resilient. Indeed, resilience may refer to the steps leading to the perturbed or damaged state / consecutive to the shock. Depending on the definitions, the state of resilience is thus a return to the state prior to the crisis, to normal, to stability, etc. This condition is often thought in terms of a threshold of restoration / reconstruction. However, this threshold is highly dependent of the criteria taken into consideration and it varies considerably according to the authors and the systems considered. To say that such a system or such an element at risk was resilient is to declare a posteriori the fact that it was able to withstand the impact and to overcome the crisis that followed. They then try to account for the process that led to this state of resilience. It is a diachronic perspective: the reasoning is done about a long period of time, seeing resilience as a dynamic process - part of a time continuum - that has its own temporalities and rhythms. Resilience as a process can be described by taking into account shorter or longer time steps. The process is often broken down into various stages. The state of the system can then be measured at each stage from a number of indicators that should enable estimating the level of return to the previous state, the level of reconstruction, the share of the same and of innovation, etc. 8Conversely, other researchers consider resilience as a property. They regard resilience as an inherent quality of a system or an element at risk, an ability that manifests itself at the moment of the impact but that was already there. The focus then is neither on the result nor on the impact but on the system or the element at risk. The relation to time is different: resilience pre-exists the impact, it is a potential, revealed through the impact. It is, in a way, a-chronic. Furthermore, if resilience is a quality, it can be innate or acquired but, unlike in the previous definition, it is not defined by observation a posteriori. One can be resilient without knowing it. This approach enables to initiate prospective and preventive approaches. Indeed, if we think upstream of the crisis, we can seek improving the resilience of a system in order to enable it anticipating disruptions, preparing and coping. When pressing on the process, one takes in a better perspective on feedback that allows learning from past failures. 9Nevertheless, process-resilience and property-resilience are not conflicting: the intrinsic qualities of the systems, combined with exogenous factors are what will determine the process of resilience and the trajectory of the system. Consequently, even though the two meanings are linked, they do not pertain to the same methodological position and their theoretical implications are not univocal (Cutter et al., 2008). If resilience pertains to observation, to the assessment of a third party, it is necessary to establish the criteria to be used to say if a system is resilient or not (part of the same and of the other, time scale, etc.). Then comes the question of the nature and the levels of qualitative changes that allow to talk (or not) of resilience. In a very schematic way, after an impact, three states can be observed: a definitive disappearance, the survival of the system as it was, and a structural change that corresponds to a radical structural change of the system. However, there is no agreement as for a correspondence between the degree of transformation and the state of resilience. For example, for some authors that rely on ecology, there is no radical opposition between structural change and resilience, flexibility and openness being consubstantial to resilience’s process. For others however, resilience means stability assimilated to survival without change. Others still see that stability as a differential adaptation of the system’s components, with a transformation of some elements while keeping an invariant core whose outlines have to be defined (table 1). The resilience of a material is the quality of being able to store strain energy and deflect elastically under a load without breaking or being deformed1 (Gordon, 1978). This definition, from physics, is about the plasticity of a material which translates into flexibility and adaptation for social systems or individuals. 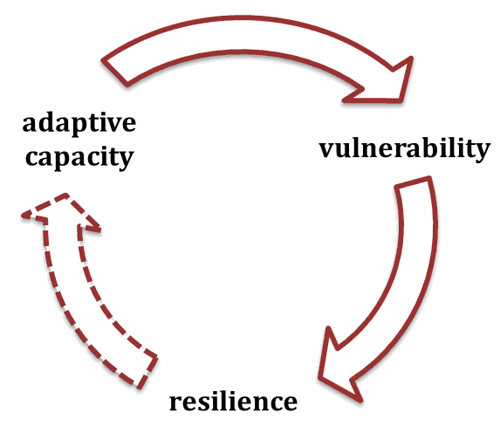 Resilience becomes the adaptive capacity of the element at risk. Resilience is the ability, for an element at risk, to withstand disaster2. This definition is strongly linked to the ideas of loss and damages that refer to the literature on physical vulnerability and the impact approach in physics and engineering. Resilience is the ability to recover or rebuild. This idea was formalized from the 1970’s and is used metaphorically (Klein et al., 2003). Resilience is a system’s ability to maintain its integrity and to return to its original state, a state of equilibrium, normality, when it is confronted with a disruption3. This meaning comes directly from ecology and C.S. Holling’s research (Holling, 1973). 5 “Degree to which a system is susceptible to injury, damage or harm” (Smit et al., 2000). 11These 4 definitions are not always compatible and have been a cause for virulent debates. We shall present 2 of them that are not yet resolved. The first one is on the contradiction that exists between the first 2 definitions4 and the opposition between resilience and resistance. Synonyms for some who amalgamate resistance and persistence by implying that persistence pertains to strength and stiffness – which is exactly what Holling wanted to disprove in 1973; intimately linked for others who believe that resilience gives the system time to adapt; those two interpretations are strictly distinct for some other researchers. To them, resistance refers to damages5 where resilience refers to the impact (Smit et al., 2000; Adger, 2000): resilience relies on a capacity to adapt and implies flexibility and plasticity where resistance implies opposition and stiffness. 12The second point of debate comes directly from controversies in ecology and pertains to the link between resilience and stability. To the engineering resilience, a resilient system is a stable system, close to a permanent state of equilibrium (Pimm, 19846). According to this definition, resilience is a capacity to stay the same through an impact. This capacity is correlated with the element at risk’s resistance and can be measured through its speed to regain its equilibrium. To the ecosystem resilience or ecological resilience, however, a resilient system is a system that will not maintain its functions and its essential structures through a state of equilibrium but through different states of stability (stable and unstable)7. For Handmer and Dovers for example, an unstable system will be highly resilient since, because of this instability, it will be able to withstand multiple disruptions. 13Resilience was only recently introduced to research on hazards in French geography. However, it was in use as early as the end of the 1990’s in other areas of the discipline. 14The concept was especially present in theoretical geography through the self-organization and the dynamic systems theory paradigm (Pumain et al., 1989; Lepetit, Pumain, 1993) and in the context of thoughts on disruptions and transversal structural changes from natural (Prigogine, 1978) and social (Bessin et al., 2010) sciences. The Archaeomedes collective (Archaeomedes, 1998) had geographers and archeologists work together to study France’s South-East urban system in the long run - this system being thought as the most resilient form of human inventions. Resilience was evaluated through the “geographical selection mechanisms” with an archeological criterion: the maintenance (survival) of a site’s use. During the same period, Christina Aschan-Leygonie wrote a pioneer thesis on the resilience of the Comtat spatial system (Aschan-Leygonie, 1998). From the start, it states its affiliation to works dating from the 1980’s on diachrony and the critical periods of spatial systems. Referring to C. S. Holling, Christina Aschan-Leygonie settles the debate on polysemy by stating that resilience is “a system’s capacity to assimilate a perturbation to its functioning without a change to its qualitative structure”. In the context of geography, resilience is thus the ability of a system (social, spatial, economical, etc.) to reproduce itself: it is not continuity without change but the ability of an element at risk to maintain itself through a disruption or even to assimilate the disruption to its functioning. 15Christina Aschan-Leygonie’s thesis brings up at least two questions relevant in today’s cindynics. First, how to determine the structural change of open systems in constant change that are the socio-spatial systems? Second, how to explain the survival or the fall of those systems? Specifically, can we use the systemic properties that can explain the resilience of ecosystems to explain the resilience of spatial systems? The thesis clearly shows how hard it is to transfer concepts relating to biology or even inert matter to human societies. These are questions brought up by human ecology projects both in France (Robic, 1992; Bertrand, 2002) and in the United States (Chorley, 1973) that have slowed the introduction of resilience in French hazard geography. 16Christina Aschan-Leygonie’s work was an inspiration for more research. Géraldine Djament revisited resilience in her geo-history thesis on the reproduction of Roman centrality (2005). She emphasizes on the risk for steadiness inherent to resilience and suggests a change in the temporal scale – a switch to a longer period of time shifts resilience’s issues to urban perennity (Vallat, 2009). The goal is no longer to characterize a socio-spatial system as resilient or not, as it is to analyze what changes and what stays the same in a socio-spatial system that faces a crisis, and especially to understand for whom and for what. 17Instead of resilience, Géraldine Djament prefers the concept of spatial reproduction to insist on the interactions between the re-production of the same and the production of the other, interactions that make spatial systems irreducible to ecosystems (Djament, 2005). While resilience focuses on spatial systems dynamics, reproduction aims to present their historicity, that is to say the link between their evolution and the maintenance or the transformation of the social hierarchies. 18Meanwhile, numerous publications do not explicitly use the concept of resilience, even though the studied objects and issues are very similar. Let’s illustrate this through the “post-” literature. 19The prefix “post-” (postmodern, postcolonial, post-conflict, post-apartheid, post-socialism, etc.) marks transformations of systemic size on a length of time that is both relatively long (one or two generations) and contemporary. It is used to analyze the changes in society characterized by the telescoping of different processes (transition, reconciliation, globalization, emergence, etc.) that mark the reorganization of political, economical and social institutions after a crisis. “Post-” translates a difficulty to isolate a clear break with the previous period and rather indicates a progressive fray – like a comet tail – and the fact that there is not enough perspective yet to appreciate the entanglement of the old logics and the new processes that are going on (Houssay-Holzschuch, 2010). It is a “transition” period, a phase of uncertainty, great upheaval and territorial restructuration: a moment of “in between”, characterized by a political, economical and social discontinuity, that reactivates the heritage of many previous historical periods, a moment of interference between conflicting processes, logics, codes and markers (Rufat, 2008). The ongoing processes do not bring about something that is radically new: it’s something that is added, a new stage, but still dependent on the inertia of inherited structures: it is the “path dependence” (Hamilton et al., 2005). 20Finally, over the last two decades, the prefix “post-” won over other terms. Mainly because it is the least teleological: “transition” implies returning to normality (i.e. “transition towards market-economy”), “transformation” presets a final state (the same way as “modernization” does), “metamorphosis” implies a linear trajectory without uncertainties or going backs, “structural change” insists on remodeling over heritage, “palimpsest” on continuities, etc. (Harloe, 1996; Rufat, 2008; Houssay-Holzschuch, 2010). The mutations that happen after a crisis cannot be reduced to the emergence of new properties. They express the conflict between a present indecisive remodeling and different conditions from the past such as inherited situations from before the crisis, previous dynamics that are reactivated, traumatisms that are brought back to light. The crisis brings about periods of turbulence, uncertainty and fluctuation, marked by the meeting of old processes and new properties, by temporalities that get entangled. During those periods, it becomes difficult to identify what pertains to adaptation from what pertains to resilience or inertia, especially spatial structure inertia, because the transformations happen according to different rhythms in the political, economical, socio-cultural and territorial fields (Gervais-Lambony, 2003). 21Ultimately, there are post-crisis situations that are considerably more marked by inertia and going backs than by adaptation or emergence. Contrary to resilience, “post-” insists on uncertainties rather than continuities and focuses on turbulences, ambivalences, contradictions, entanglements of processes and multiplicity of temporalities and points of view. 22The multiple meanings of resilience can be explained, in part, by multiple cross-disciplinary transfers. In fact, each discipline contributes to its polysemy. Depending on the corpus, resilience will refer to notions that are more or less closely related: resistance, ability to face a crisis, capacity to adapt, to respond, to go back to an equilibrium, shock absorption (system), reconstruction (buildings), reconstruction (political and social), reconstruction (symbolic), structural change, self-organization, transition, trajectory, sustainability, perennity, etc. Every one of these notions will slightly change the meaning of resilience. 23Furthermore, borrowings and transfers face methodological issues that become even worse with the difficulties arising from a search to establish pertinent analysis criteria or to make resilience operational (Manyena, 2006; Dauphiné et al., 2007). The passage from theory to practice thus leads to an alteration of the concept, everyone pulling resilience towards its own meaning to adapt it to its own object, its own issues, etc. 24The first issue comes from formalization, in order to make the concept applicable. The consecration of resilience could be interpreted as an answer to an operational dead end. Certainly, the pertinence of a theoretical concept lies essentially in its heuristic potential or its hermeneutic power and not in its purely practical efficiency. Nevertheless, resilience was immediately seen as an opportunity to enrich or even renew the management systems such as the policies contributing in fine to reduce hazards and disasters. It must be emphasized that cindynics can hardly be independent from this passage from theory to practice. In hazard geography, the theory is quickly put to practice (Vinet, 2010) and Patrick Pigeon even wrote: “hazard geography is now acknowledged, to the point that the distinction between fundamental and applied becomes quite thin” (Pigeon, 2005). 25In fact, if we analyze the hazard research, we see that the concepts change as we encounter obstacles to make theoretically seducing tools operational. For example, the works on hazard have given priority to hazardous process and danger for a long time (Morel et al., 2006). In face of the incapacity of sciences and techniques to eradicate threats, the adaptive capacity of societies was brought forward in the years 1940-1960 (Chorley, 1973). The concept of vulnerability was used in the 1990’s to link the damages and the social sciences approaches (Cutter, 2006; Reghezza, 2006). But adaptive capacity, shock absorption, vulnerability, etc. are useful concepts to a posteriori cases study, by dissecting mechanisms and identifying explanatory factors. However, they are not easily applicable as shown by the increasing human and financial cost of disasters despite the money and energy invested in knowledge, prevention and protection (White et al., 2001). Since there are no invulnerable societies, cities or territories, one will focus on reconstruction and its corollaries (shock resistance, adaptation, etc.). Hazard reduction will then be tackled through a resilience angle (Vale et al., 2005) that permits a more positive, optimistic view. Furthermore, resilience doesn’t come from a critical view of hazard, unlike vulnerability that was strongly linked to radical positions (Wisner et al., 1976; Hewitt, 1993; Quarantelli, 1998). It provides with a project that is consensual and integrating, a realm of expectations and actions (Lallau, 2011). 26Consequently, resilience’s success answers a need to put into practice what the previous concepts can’t satisfy. Paradoxically, however, its operational pertinence constitutes a central question and was doubted from the start, especially in hazard geography (Dauphiné, 2004). Figure 2: From vulnerability to resilience: moving forward or backward? 8 “Degree to which a system rebounds, recoups or recovers from stimulus” (Smit et al, 2000). 27A first debate questions the possibility of objectifying resilience. Because when resilience is defined as “a degree to which a system rebounds8” or as “the measure of the capacity to absorb a shock9”, one enters the domain of evaluation. This implies to produce adequate indicators that become so many ways of objectifying resilience. No matter how one sees resilience – as a process, a state or a quality – it introduces subjectivity, discourse, norm, etc. for there has to be someone to say that there is resilience and to establish the levels that will define this state of resilience. Thus, resilience is a discursive construct that allows a qualification of a situation or a property a posteriori by giving it a positive dimension. If the political interest can easily be seen, the notion’s operational pertinence remains evasive. 28Furthermore, and this is a second difficulty, to define resilience, authors recall earlier concepts and rely on them, drawing some sort of circle where every term is linked to the other but without enough information to know just how they relate to one another (figure 1). For example, for some, resilience is part of vulnerability (Burton et al., 1978; Fabiani and Theys, 1987) whereas, for others, it is defined as the adaptive capacity (Holland, 1995), in opposition to anticipation (Wildavsky, 1988). Vulnerability being the incapacity to face the impact because of a lack of adaptability, resilience and vulnerability are then opposites, which is in contradiction with the previous meaning that implied that one came from the other. 29These formalizing difficulties that come in part from the multiple approaches to resilience that feed its polysemy have an immediate consequence: in practice, many interpretations are incompatible. For example, when the very poor are the first to come back to the disaster areas after an impact, some see a proof of their resilience, others of their vulnerability, others still of the metropolitan system’s inertia or of the captivity of those populations (even if those categories do not necessarily correspond to reality). Moreover, it becomes evident that, to be resilient, a system must, at the same time, be redundant, diversified and efficient; autonomous and collaborative; stiff, flexible and adaptable; capable of learning from the past and of facing future uncertainties; etc., which, every time is evidently contradictory and do not, in the end, allow to find satisfying solutions, either from a heuristic or an operational point of view. 30What was just discussed brings us back to one of resilience’s use main issues, which is the relation between vulnerability and resilience (figure 1). 31Resilience Alliance’s work is particularly interesting here. The organization’s objectives are, first, to stimulate multidisciplinary academic research on resilience (linked to the issues of sustainable development) and to inform politicians (especially the ones with an international reach) about their popularized results. To do so, Resilience Alliance works with a group of researchers with explicit theoretical bases (Holling, 1973; Carpenter et al., 2001; Gunderson and Holling, 2002). In fact, their research is the basis for the concept’s definitions and its application to “socio-ecological systems”. 32To give resilience an operational, intelligible and intuitive definition (Folke et al., 2002), this organization chose to define it as the “flip-side” of vulnerability: resilience becomes the antonym of vulnerability, its positive counterpart. The will to bring forth the “positive” aspect of resilience (Klein et al., 2003) is truly linked to a search for application: while vulnerability pertains to a negative connotation (incapacity), resilience becomes a system’s desirable property towards which management should lean. 33The matter is that one can be vulnerable to an impact while being perfectly resilient. It is not possible to systematically oppose vulnerability and resilience. This is especially obvious with cities where, however is defined vulnerability (as a damage potential, a degree of exposition, an incapacity to face an impact) we see a multiplicity of examples of cities exposed to hazards, hit by disasters, hence vulnerable, that yet manage to rebound, recoup and reconstruct, to come back to an equilibrium, to normality, etc. Vale and Campanella even wonder over the remarkable resilience of cities, since history only relates the definitive disappearance of a few cities while urban disasters are innumerable (Vale, Campanella, 2005). In a certain way, it could be said that it is because one is vulnerable that one can be resilient: in the strictest meaning, there can only be resilience if there is an impact and a disruption, which, analytically, implies vulnerability. But in a larger sense, it is because a society or a territory is vulnerable that it will suffer crises and that it will have to face up, to adapt and to learn from the disaster. The more crises a system suffers, the better it can show resilience capacity (property), learn from the disaster and become resilient in fact (state). The problem then lies in hazard acceptance, not as fatalism or as the acceptance of the disaster, but as the price that a society is willing to pay when this society takes a risk. 34Furthermore, because of its technical aspect, we tend to associate vulnerability with material structures. But in this context, associating vulnerability and resilience becomes an aporia. If we keep to buildings, forms, networks and structures, resilience means maintenance of service, the possibility to function, even in a diminished state, and speedy reconstruction. But an exact reconstruction of what was, even if it allows the maintenance or the reconstruction of functions, constitutes a problem because it doesn’t account for the crisis: nothing is learned from it. To put it another way, the system remains as vulnerable as it was, which is in opposition to the idea that resilience is desirable. Conversely, a reconstruction that aims to adapt the system to disasters is also problematic because it can, and sometimes has to, radically change the networks’ topology, the buildings’ structures and thus, the system’s functioning, which leads to a structural change and no longer to resilience. 35The passage from vulnerability to resilience cannot be limited to a simple semantic shift: the two terms are not interchangeable and the continuum question has to be explored as for what would make it possible to go from one to the other (cf. “resiliencery vulnerability” Provitolo, 2012). An inversion of the terms is even less desirable considering a certain tendency to use vulnerability’s analysis methods on resilience, which basically comes down to shifting those methodological issues without solving them. Thus, the pertinence of the indicators that would allow measuring a system’s adaptive ability or the analytical approaches’ limits stays questionable (Dauphiné, 2004). Moreover, it is not enough to transpose vulnerability’s factors into resilience’s field to understand hazard dynamics because a vulnerability factor can also be a resilience factor. Kobé after the 1995’s earthquake (Menoni, 2001) or Manhattan after 9/11 (Sassen, 2004) showed that the concentration of strategic functions in large cities is a powerful damage factor – and hence a vulnerability factor – but that it is also a formidable stimulant for a speedy reconstruction and a return to “normality”. 36Talking about resilience brings up the question of pertinent scales. Urban resilience’s example is yet again particularly interesting. Resilience is a property known to the city system (Archaeomedes, 1998) but what about the city’s resilience and the resilience of the urban system’s various components? How do they work together and on what length of time? 37For example, there has to be a systematic distinction between city scale and intra-urban scale on one hand, regional, national and global scales on the other. There can be resilience at an intra-urban scale without resilience at an inter-urban scale. A city can be rebuilt but lose its rank in the urban structure, as was the case in Martinique with the city of Saint Pierre after Mount Pelee’s eruption in 1902. There can also be resilience at an urban scale but not at an intra-urban scale and inversely. L. Sanders mentions that a neighborhood can be affected with an important change without necessarily leading to a structural transformation of the city (Sanders, 1992). Julie Hernandez’s analyses show the same for New Orleans (Hernandez, 2010). To yet another scale, the disappearance of a secondary knot on the globe will not lead to the collapse of the latter; on the other hand, the disappearance or the damaging of a “global city” can affect the system’s structure (as was the case with the big earthquakes in Tokyo and Los Angeles). 38The scale question has to be linked to the one about the nature and thresholds of the qualitative changes that allow to talk (or not) about resilience. The city suffers continuous internal fluctuations or external perturbations that can produce a new state, or not. The question is, then, to know from what threshold adaptation is no longer a renewal but rather gives birth to a new object and, if it does, to what spatial scale. Accordingly, after a disaster, a spatial reduction or, conversely, an expansion of the urban space can be seen. While rebuilding, the city can absorb outlying districts that were not or badly integrated like Los Angeles did after 1933’s earthquake (Davis, 1998) or, on the contrary, it can lose its traditional sphere of influence like Saint Pierre after the 1902 eruption. If it can easily be said that there is no resilience in the second case, it is not so clear for the first one. 39Most of the research on resilience also has to deal with the temporality question. After a crisis, the system’s different components will not react at the same speed. There is, for example, a differential resilience within the city: some neighborhoods, functions and activities will rebound faster than others. S. Menoni showed that, in Kobe, the reconstruction happened in two phases. It was very fast for the mercantile world and its associated structures with the rebuilding of the port. On the other hand, it was rather slow for the housing districts (Menoni, 2001). There was also the case of some New Orleans communities that were faster than others to rebuild, which could be explained by a particular fondness for the destroyed landmarks and a strong “community network” (Li et al., 2009). 40Another issue pertains to the when. When can it be said that there was resilience? Let’s take Port-au-Prince for example. Struck down by an earthquake on 12 January 2010, it is no longer in crisis per se but neither is it back to “normal”. The capital’s inhabitants seem to have been able to get over the death of 250 000 people and the destruction of 80% of the city’s housing neighborhoods to calmly participate in the Haitian presidential election one year after the disaster. But less that half of the twelve ministries were reinstated and refugee camps piled up at the city’s periphery (Comfort et al., 2010b). Is it then too early to talk about resilience or can it be said that there wasn’t any? In the same manner, one year after Katrina, Julie Hernandez gave a very contrasted report on New Orleans reconstruction: 20% of the city – indirectly touched by the flood – were functioning but the other 80% consisted of empty houses (Hernandez, 2010). Only 220 000 of the 600 000 downtown inhabitants were back. How long does it take then to study a system’s resilience: a year, five years, ten? And can the notion be used to study a very long period of time: a century, a millennia? To talk about resilience, one needs to identify a terminus ante and a terminus ad quem. To do so, one will also have to establish the temporal scale to which the notion is pertinent so that a reference state can be defined to allow the use of resilience. 41This question about temporalities explains in part why some researchers refrain from using resilience. We have seen that some of them prefer the prefix “post-” to resilience to qualify a period of uncertainty and turbulence without prejudging the ongoing processes’ nature or dynamics’ trajectory. There is also the fact that studies on “post-” came before the wider spread of resilience. However, this is mainly because resilience doesn’t resolve the question of when the crisis stops and the “after” begins, doesn’t implicitly define what is “going back to normal”, doesn’t explain how old ways and new ways interact, doesn’t give a clear view of what is happening and what is to come, etc. Studies on “post-” and debates on transitology allow talking about an ongoing process using categories that stay open instead of having to wait to be able to give an a posteriori verdict. 42Proclaim resilience brings forth a resilience referential that is neutral in neither a normative nor political point of view. For example, stating that a situation is back to normal implies a definition of what normality is. From that moment on, the question of who states resilience, when and why takes a whole new meaning. 43Spreading out of the academic domain, resilience has entered the political field. For example, showing the success of the reconstruction as quickly as possible is a strong political move that shines a good light on the successful leaders. This process was studied by Helen Harter in the case of Chicago’s great fire of 1871 (Harter, 2004) and in Vale and Campanella’s work on resilient cities (Vale and Campanella, 2005). Conversely, an authority not declaring resilience may well maintain exceptional situations, point at guilty parties and ensure the continued existence of economic and humanitarian aid. We thus have to study resilience as a political line. What does the use of resilience imply? 44In cyndinics the shift from one concept to another (disaster to hazard, hazard to vulnerability, vulnerability to resilience) sharpened the binary oppositions such as hazard/vulnerability, vulnerability/resilience, risk production/risk construction. The latter has major political implications that are well illustrated in the case of urban resilience. 45In social sciences, urban risks can be interpreted in two different ways: the construction and production of risk. These two notions are confusingly close and we propose to distinct them carefully. We have to keep in mind that the city represents a triple ideal of protection, rationality and environmental control. Risk can be considered a threat which, far from being totally exogenous, is produced by society and urban organisms. Thus, urban risks are an endogenous “social productions” (Blaikie et al., 1994). Risk is a product that must be analyzed as the revealer of malfunctions in the urban system (Chaline et al., 1994; D’Ercole et al., 1994). As a result, megacities have been called “crucible of hazards” according to the many interactions between urban growth, hazards and vulnerability (Mitchell, 1999). On the other hand, risk can also be considered as the perception of an upcoming virtual event rather than a reality that threatens society. Consequently, urban risks are social representations congregating judgments, speeches, individual and collective cultures. Risk is defined and administrated by means of thresholds, expertise, standards and management procedures: it is an instrument constructed by social representations. Risk is a construct, an artifact at the heart of modernity allowing individuals to transform dangers and uncertainties in predictions in order to guide their action (Beck, 1986; Giddens, 1990). 46These analyses produced a more endogenous interpretation of urba hazards but also led to a double paradox: risk construction hides and maintains risk production. Cities then become, at the same time, the greatest risk producing places and the places with the biggest accumulation of fast response crisis services. The need for security and prediction ends up being the source for hazard and disaster overestimations. The articulation between risk construction and risk production thus pertains to urban “counter productivity” as formulated by Ivan Illich (1973): the latter will, for example, make captive the poorest inhabitants of big cities by making them more vulnerable instead of giving them the protection they were looking for. It is then possible to interpret the introduction of resilience to management policies another way. On the one hand, vulnerability seems to be on the side of risk production, at a collective level and before the crisis. On the other hand, resilience seems to be on the side of risk construction, at an individual level, after the crisis, on longer periods of time. 47The articulation between vulnerability and resilience then becomes problematic. Vulnerability was an answer to the needs of international organizations for which preventing disasters is done through aiding the most fragile societies which are, in most cases, the least developed ones. If the logic behind resilience is pushed to its limit, resilience is a direct result of those societies’ vulnerability since one has to have suffered a crisis to be resilient. Defining resilience as a capacity to cope, reconstruct and restore implies a prior damage, thus vulnerability, understood as a susceptibility of damage. Consequently, resilience presupposes an indomitable inner fragility and in a certain way, the acknowledgement of that fragility. Hence the recurring interrogations about the use of the concept in the current management paradigm that primarily aims to reduce hazards and vulnerability. Hence too, the insistence on avoiding to go back to the original state since this might reproduce the same vulnerabilities that led to damage and crisis. As a result, resilience rather requires seeing the crisis is an opportunity to improve things. Therefore, resilience may also appear as a powerful legitimating instrument for political action. 48The shift from vulnerability to resilience is not neutral from a political point of view. Its implications can be seen through different agencies such as the UN, NATO, the European Union and regional organizations as shown in Sandrine Revet’s work. Between the end of the 1980’s and the beginning of the 1990’s, those stakeholders have developed a multitude of programs, norms or guidelines to show the “right” way to deal with disaster and most of all, how to get prepared to lower consequences. Those programs contributed to the building of a responsibility model based on individual failures: the failure to perceive danger, to respect the environment and to develop a “good citizen” attitude, explaining the presence of buildings in hazardous areas and the “pathological” aspects of social behavior (Revet, 2009a). The introduction of vulnerability in the 1990’s has altered this logic: international authorities have proposed a new way of understanding populations’ individual failures. These populations have then been considered as pure victims incapable of getting over damage and crisis without help (Revet, 2009b). International agencies have then been focusing on material and social characteristic in order to target the more vulnerable populations. However, this shift is far from the development structural issues revealed by researchers on vulnerability. Agencies have not been trying to identify the structural causes for disasters but rather to target for aid programs by still focusing on individual fragility and failure. 49During the 2000’s, facing budget cuts and an increase in disaster costs, those programs were frowned upon, accused of inducing people’s passivity. Organizations then brought forth notions of participation, community and of people’s capacity to face crises (Ambrosetti et al., 2009). This new responsibility model emphasizes on individual participation in the process that leads to resilience; the discourse is now centered on the local stakeholders, not the victims: “Disaster risk reduction is a no-regret investment that concerns everyone, from villagers to heads of states, from bankers and lawyers to farmers and foresters, from meteorologists to media chiefs. The UN Resilience Framework promotes the decentralization of authority and resources to promote local-level disaster risk reduction; citizens, including indigenous communities and other vulnerable populations must participate, be actively informed, and take individual responsibility” (UNISDR, 2012). The notion of adaptation becomes fundamental because it helps strengthen this new orientation, especially from 2004 with the publication of UN’s report Living with Risk; the injunction to adaptation is presented as the means to face climate change (UNISDR, 2004). The notion of resilience is put forward as a more flexible strategy than prevention or mitigation. It became even central in 2007 when 168 countries adopt the Hyogo Plan “building the resilience of nations and communities to disaster” (UNISDR, 2005). And in 2010-2011, the recent UN Making Cities Resilient Campaign has clearly put forward the urgent need for action and the responsibility of local governments as well as individual stakeholders: resilience has become an injunction to local and individual responsibility, participation and adaptation (UNISDR, 2010; UNISDR, 2011; UNISDR, 2012). 50The recent shift from vulnerability to resilience gives a glimpse of a radical change in the approach of international agencies to disaster management. On one side, a social vulnerability, mainly suffered by the poorest populations but that can be anticipated and reduced by various aids relying on solidarity and states’ participation. On the other, a desired resilience that is only validated long after the crisis and that sanctions adaptation at an individual level. 51This shift allowed for the comeback of a moral interpretation of disasters with very harsh criticisms against cities and stakeholders that do not abide by the dominant model. The new injunction to resilience expresses a change in the political strategy: it goes from a centralized prevention to focusing on the local, on community participation and on individual responsibility (UNISDR, 2005). Working at an individual or a community scale and putting the responsibility mainly on the local stakeholders leads to blaming everyone that doesn’t abide by the “good” practices: it stigmatizes those who do not participate in resilience’s process, without any attempt to understand the causes for their “passivity”. 52Not only does resilience express an injunction to adaptation, it also expresses an obligation for the people concerned with international programs to participate actively: they must get informed, motivated and organized to act on the situation (UNISDR, 2011). We go from victims to heroes. UN’s recent campaign Towards Resilient Cities is very explicit on this point: the UN imagery of vulnerability (UNISDR, 2004) – a black woman, alone or with a child in her arms – has been replaced by an imagery of resilience (UNISDR, 2010) – fit, smiling men rebuilding a community clinic or erecting a dyke (Revet, 2011). First, the image of vulnerability created by the UN two decades ago is far from the radical interpretation of the 1970’s that was denouncing the economical and structural causes for disasters. Second, the new image for resilience in use by international agencies to communicate on their new programs is far from either disaster or social claims. This shift conveys need to go from victims to heroes. This need to produce heroes can also be seen at a city scale with a showcase of model cities, right practices, mayors and local leaders, etc. 53Accordingly, the injunction to resilience could be analyzed as a new way to govern those who are vulnerable. To see resilience as an intrinsic property of systems leads to posing some sort of resilience teleology that makes societies virtually resilient in essence. Talking of resilience focuses the attention on the individual responsibility of the people suffering crises, whatever the negative interactions of their social sphere or their environment, or the positive results of the crisis for the rest of society. Hélène Thomas has shown that management policies treat vulnerable people as individual citizens hit by hazards and misfortunes that are being taken care of by the community, for humanitarian reasons. They are expected to take part in their moral and social rehabilitation and to actively participate, with their own resources, in the actions taken. The management of vulnerable people relies on the ancient rule stating that the poor or the citizen is expected to offer compensation for the assistance that is given to him or her. He/she has a moral or civic obligation to give back what was given, in the way that is then imposed, to show his/her will to make it through (Thomas, 2010). 54The pernicious effects of this injunction to resilience can also be seen at an international scale, as illustrated by Haiti’s case after the earthquake of January 2010 (Comfort et al., 2010b). The public sphere was saturated with images of Port-au-Prince’s inhabitants going back to pray in their ruined churches surrounded by corpses, or by those of a little girl who had lost her whole family and her legs but who, nevertheless, showed an exceptional strength of character. At the same time, the fatality condemning Haitians to collectively resign themselves to chaos was greatly insisted upon (Huttes, 2011). Conversely, almost no one commented the fact that the cholera epidemic after the quake was in fact a side effect of international aid (Elhofy, 2011). Haiti’s disaster has been analyzed through resilience, insisting in people’s qualities, but not through Jared Diamond’s work that has shown how colonial powers have kept Haitian society isolated and vulnerable for the past two centuries (Diamond, 2005). Port-au-Prince’s disaster was not due to the qualities of Haitian people but to the under development of the island; and this is something that the concept of resilience tends to leave aside, leading people to believe that individuals can reach beyond fatality and determinism through mere willpower. 55Resilience allows for a comeback of disaster conceptions that were thought to be obsolete. Some discourses on resilience even favor a return to the 18th century with a moral interpretation of disasters as divine punishments transposed to an individual scale. This step back can lead to the idea that the weakest, the more vulnerable have to be sacrificed so that the less vulnerable, the stronger can repent and choose to adapt. Furthermore, by presenting resilience in a teleological way one eventually naturalizes vulnerability. Resilience then brings back a determinist discourse that can even lead to social Darwinism. In a certain way, this completes the circle. Adaptation has been chosen since as early as the 1920’s as a way to go beyond mesological determinism (Zimmerer, 1994), and looking for resilience factors leads to the identification of the physical, biological, social and psychological factors that determine the hero (Revet, 2009b). 56At last, resilience can present itself like a story turned incantation of the post-disaster. This makes discourses on resilience a tool for power similar in Foucault’s concept of “governmentality” (Foucault, 1994). In creating a realm of expectations desirable by all, resilience allows for an imposition of choices and behaviors. In promoting a “bouncing back”, leaders favor a social and political status quo; in presenting the crisis as an “opportunity to improve things”, they make use of a powerful legitimating instrument for their choices and actions. The tension between those two sides of the discourses on resilience reveals its political issues. 57The political implications of resilience can be found at a community level when the disaster is shown as an opportunity for a necessary purification of the “bad” city so that the “good” city can thrive after the disaster. Those mechanisms were observed well before the introduction of resilience in the discourses and practices, but the study of resilience now becomes quite pertinent to deconstruct the idea of a “normal” functioning of our cities. In fact, it makes it possible to identify who sets the norms for resilience, what are the conceptions of the normal city and what do those norms say about the political project (or about the conflict between different political projects). 58Unlike in Port-au-Prince, resilience was not brought up in Bucharest. But the earthquake of March 1977 gave a pretext to condemn the historical downtown and to plan the destruction of more than 200,000 living accommodations that were “bellow the standards” (one third of the capital’s housing). The disaster served as a pretext to apply an old modernization scheme that dated from the middle of the 19th century, when Bucharest became the capital of a newly independent Romania. In this context, the crisis cycles (wars, earthquakes, floods, fire) are all opportunities to put an urban project to practice – in this case, the eradication of the mahala that represented the “bad” city. Those oriental neighborhoods, built out of wood and cob, rather correspond to the slum as it was defined by the UN. They had to be destroyed to make way for a modern, resistant, monumental European capital that should become a showcase for the country. But if the town planner’s “good” city is resistant, the mahala’s “bad” city is resilient since, even if periodically destroyed, it quickly comes back after a trauma (Rufat, 2008). In Bucharest, the leaders looking to impose their urban project did not use the concept of resilience because it was working only for the “bad” city. However, in a certain way, the slum is the representation of urban resilience: it keeps on functioning even when damaged, it gets rebuilt quickly; slum and refugee camps are built with light materials, and have no need for infrastructures, viability networks or property ownership allocation. 59Hence, resilience is not always useful. Haiti’s earthquake is also a bitter example of a disaster that does not play a purifying part, and that societies will not necessarily change for the best after a major crisis. Political dysfunction, social polarization and hunger are also part of resilience’s process. This is what Julie Hernandez showed with the case of New Orleans: resilience can be “bad” when it brings back things that didn’t work or were harmful in the first place (Hernandez, 2009). 60It is necessary that we rid ourselves of the preconceptions that we have about resilience that make it a desirable absolute horizon, to the extend of suppressing any debate. What lies primarily behind resilience are political choices. This is why resilience carries an implicit idea of the “good” city or the “good” poor through the promise of a bright and sunny horizon – as can be read in the last UN campaign slogan: “Making cities resilient – My city is getting ready”. 61Resilience is a rich concept that has the patent advantage of being stimulating. However, its use brings up substantial definitional, methodological and political issues that we must – if not resolve – at least state explicitly. To talk about resilience, one must at least identify: the system that goes through the crisis, what is the crisis, who stated it so or defined it as such, its characteristics and what are its spatial and temporal limits. Resilience’s key issue is to know who says that there is resilience, when and why. 62Resilience cannot be an absolute realm of expectations and shouldn’t necessarily be looked for in the layers, landscapes and material structures of the city. The different examples that we presented showed that it doesn’t solely lie at the city’s buildings and material structures level: it involves some forgetting to allow a reconstruction, even if identical, and to adapt and impose a change in the urban structures and functioning. Resilience, however, must always be analyzed as a political speech that aims to impose choices that should, at least, be publicly discussed, whereas its use tends to shift the attention from political and social processes to technological solutions. 63To us, resilience offers at least three opportunities. 64First, from a heuristic point of view, resilience has proven its efficiency. For example, it forces us to reflect on the pre- and post-crisis temporalities and to combine cyclic and linear times. It urges us to take into consideration the memory of the disaster by developing diachronical comparisons or to combine, fit together or confront the temporal and spatial scales. The deliberate anachronic use of the notion makes it possible to historicize resilience and thus compare the discourse and the reactions of the different societies confronted with disasters, to understand what thinking resilience changes in their management. 65Second, from an operative point of view, resilience opens new perspectives to get over wedged situations – made worse by an accumulation of negative experience feedbacks – by giving hope in the possible existence of other solutions that need to be searched for. Managers thus develop great expectations regarding the researchers. 66Above all, from a political point of view, resilience is mainly a discourse. It opens the way to decentralization of practices and representations because it allows the bringing back of old analyses and ideas that were toned down, emptied of their meaning or marginalized. It highlights the necessity of getting over the “zero risk” logic. Resilience could have led to a debate on acceptable level of risk for every society. However, because the concept stays blurred and elastic, it was picked up by a multitude of stakeholders with divergent interests, leading to a point where now, talking about resilience is more about imposing one’s views than about opening a real debate. Alwang J., Siegel P. B., Jorgensen S. L., 2001, “Vulnerability: A View from Different Disciplines”, Social Protection Discussion Paper n° 0115. Washington, D.C.: The World Bank, 42 p.
Dauphiné A., 2004, Risques et catastrophes. Observer, spatialiser, comprendre, gérer. Paris, Armand Colin (Coll. U – Géographie). Davis M., 1998, Ecology of Fear. Los Angeles and the Imagination of Disaster, New York, Vintage Books. Folke C. et al., 2002, Resilience and Sustainable Development: Building Adaptive Capacity in a World of Transformations, Environmental Advisory Council to the Swedish Government, Stockholm, Sweden. Godschalk D.R., 2003, “ Urba hazard Mitigation: Creating Resilient Cities”, Natural Hazards Review, 4(3), p. 136-143. Hewitt K. (ed), 1983, Interpretation of Calamity from the Viewpoint of Human Ecology, Allen and Unwin, Londres, 304 p.
Holland J., 1995, Hidden Order: How Adaptation Builds Complexity, New York, Helix Books. Holling C.S., 1996, “Engineering resilience vs. Ecological resilience”, in Schulze P.C. (ed. ), Engineering within ecological constraints, Washington DC : National Academy Press. Koselleck R., 1979, Vergangene Zukunft. Zur Semantik geschichtlicher Zeiten, Francfort: Suhrkamp. Mileti D., 1999, Disasters by Design, Joseph Henry Press, Washington, D.C.
Quarantelli, E. L., 1998, What is a Disaster ? Perspective on the Question, Routledge, Londres, 312 p.
Revet S., 2009a, “ Les organisations internationales et la gestion des risques et des catastrophes ‘naturels’ ”, Les Études du Ceri, n° 157, CERI, Sciences Po, Paris, septembre 2009. Sanders L., 1992, Système de villes et synergétique, Paris, Économica, coll. Villes –Anthropos. 1 “The resilience of a material is the quality of being able to store strain energy and deflect elastically under a load without breaking or being deformed” (Gordon, 1978). 2 “Resiliency to disasters means a locale can withstand an extreme natural event with a tolerable level of losses. It takes mitigation actions consistent with achieving that level of protection” (Mileti, 1999). 3 “Resilience provides the capacity to absorb shocks while maintening function. Resilience provides the components for renewal and reorganisation” (Holling, 2002). 4 ‘Resistant’ is defined as “the ability to resist.” Do we want our communities to ‘recover from or adjust easily’ to a disaster, (which insinuates that one has occurred) or do we want them to ‘resist the disaster’, i.e., not to allow the inevitable damage from an extreme natural event to reach ‘disastrous’ proportions” (Smit et al., 2000). 6 To S. L. Pimm, resilience becomes “the speed at which a system returns to its original state” (Pimm, 1984). 7 “Holling (1973) coins the term resilience for ecosystems as a measure of the ability of these systems to absorb changes and still persist. As such, it determines the persistence of relationships within an ecosystem. This is contrasted with stability, which Holling (1973) defines as the ability of a system to return to a state of equilibrium after a temporary disturbance” (Klein et al., 2003). 9 According to P. Timmerman, resilience is “the measure of a system’s or part of a system’s capacity to absorb and recover from the occurrence of a hazardous event” (Timmerman, 1981).